SUMMARY: "The real business need for this particular campaign was educating the market to something new to them and the power of it," Karen Thomas-Smith, Vice President of Provider Marketing and Reference Management, Optum, said. 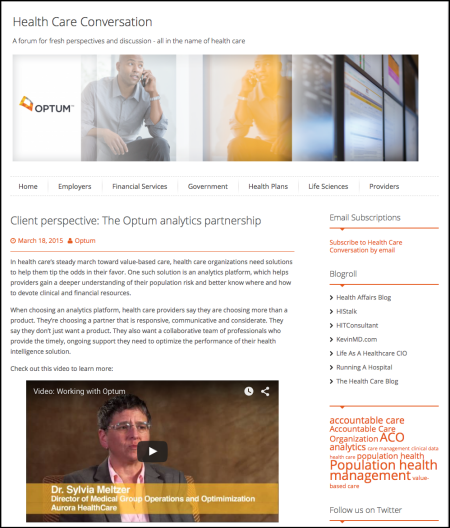 In an effort to educate her company about the potential of strategic marketing efforts and to educate the market on the importance of healthcare analytics, the marketing team at Optum launched a multi-channel content marketing campaign. Through research, person-building and "reimagining" content, Optum’s gated content generated over 8,500 downloads and the team produced over 1,000 pieces of unique content in 18 months. Out of 319 speaking submissions, this campaign was selected for the Best in Show award for MarketingSherpa Summit 2016. Karen Thomas-Smith will be a featured speaker at Summit 2016, where she will discuss her award-winning campaign with Optum. "Our purpose … is to help the health system work better for everyone. We do that by combining data analytics with technology and expertise," Karen Thomas-Smith, Vice President of Provider Marketing and Reference Management, Optum, said. Optum is a health services and innovation company. To better describe exactly what her company does, Thomas-Smith gave an example of a health system in the Midwest that is dealing with a large group of patients that have been diagnosed with congestive heart failure. Through healthcare expertise and a health-focused use of analytics, Optum was able to determine which patients, out of a population of 40,000 to 60,000, are at risk of going to the hospital six months in the future. This number is only found through analytics and prediction, which Optum specializes in. The company as a whole serves health plans, providers, employers, government, life sciences and consumers. However, the branch of Optum that Thomas-Smith works for focuses on providers. "Providers are described as anyone that provides care," she explained. "It could be a hospital. It could be a provider group. It could be home health — so any practitioner of providing care." The challenge that Optum faced was twofold. Thomas-Smith wanted to move Optum away from what she refers to as "one and done" marketing techniques, but there was also a much larger market challenge when it came to analytics in the healthcare industry. According to Thomas-Smith, the marketing challenge led to her reimagining her team, and the market challenge led to the campaign. When she came onboard the Optum marketing team, she quickly realized that the organization had a limited view of the team's capabilities. Thomas-Smith wanted to introduce a more strategic marketing strategy, but she was facing an education problem in her company. "We needed to educate them to what strategic marketing was — have an executive that sat at the table to help drive the goals, the solutions, the decisions," she said. "That was the big marketing challenge that stood before me." As large as that challenge was, the market challenge Thomas-Smith and her team faced was even larger. 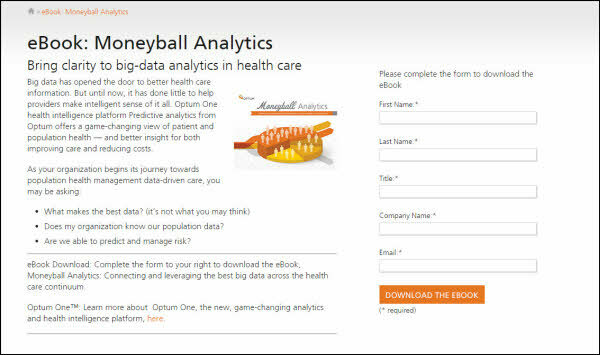 There was an industry-wide lack of understanding when it came to the function and application of healthcare analytics and application, which is a subset of the healthcare industry that Optum specializes in. Not only was she up against an educational block concerning the function of her company, but she also had to deal with outdated industry tactics. According to Thomas-Smith, the healthcare industry has only switched from paper to electronic formats in the past 10 to 20 years. "The real business need for this particular campaign was educating the market to something new to them and the power of it," she said. "Then that also kind of addressed the marketing challenge internally to show the business how [marketing] could be done differently and how impactful [these tactics] could be." Thomas-Smith and her team decided the best way to show off the power of strategic marketing was through a hands-on approach. "One of the ways that I knew that we could accomplish that was [to] show [executives at Optum] the power of marketing when it's led by content and it's led by educating the marketplace," she said. Through this content marketing campaign, the marketing team at Optum hoped to educate the marketplace on the importance of healthcare analytics, increase Optum's engagement, introduce more marketing leads into the sales pipeline and build a content marketing strategy that would have long-term sustainability. Learn how the marketing team at Optum was able to create over 1,000 unique pieces of content in 18 months, including an eBook, infographics, playbooks, videos, white papers, articles, podcasts, emails, direct mail pieces and blogs. Through this effort, Optum was able to gain the trust of its market and create over nine million impressions. Thomas-Smith describes herself as a rogue marketer, and she lives up to that title. Once she noticed a gap in analytics education in the healthcare industry, she started working to remedy this problem. According to Thomas-Smith, whereas other industries have been utilizing predictive analytics to drive their business for more than a decade, the healthcare industry is relatively behind. "Let's just take for a moment the different industries," she explained. "You get a phone call from American Express Financial Services telling you it looks like this behavior could have been fraudulent … That's analytics that are doing that on the back end." Conversely, the healthcare industry has only transitioned away from paper versions in the past 10 or 20 years. By utilizing an outdated method of documentation for so long, the healthcare industry has made collecting data and using analytics difficult. "You can't start leveraging analytics on paper. You have to have data," she said. "I call that kind of wave one in the industry — getting things in operational, electronic format." The second wave is leveraging the aforementioned data to make business and health decisions. Professionals need to be educated on what analytics are and aren't, what they mean, how you use them and the value this tool has to your overall organization, Thomas-Smith said. The healthcare industry was largely missing this education. "The real business need for this particular campaign was educating the market to something new," she said. "Then that also kind of addressed the marketing challenge internally to show the business how things could be done differently and how impactful [analytics] could be." Once she determined what the root of the market problem was, Thomas-Smith set about restructuring her team. "As marketers, the traditional role is, 'Let's build a campaign,'" she said. "I've switched it to, 'Let's understand the market before we build a campaign.'" Thomas-Smith brought in six team members with her and, with this challenge set and her team in place, she started focusing on building Optum's content marketing strategy. Instead of plunging into content creation as many companies do, the marketing team at Optum focused first on research. The team wanted to fully understand who they were creating content for as well as what problems each of their audiences may be facing. These personas were largely based off of the team's extensive experience in the healthcare industry, then validated through research conducted by an external company. This ensured that the Optum team wasn't just telling the industry a story Optum wanted to hear, Thomas-Smith said. "This is a story that definitely needs to be told at the C-suite because it is a re-engineering of how they do things and then also the story being told to the influencers and down to the line of care managers and the other people that will be using the information," Thomas-Smith said. The team focused on the best way to speak to each of their personas and the subjects each persona cared about most. 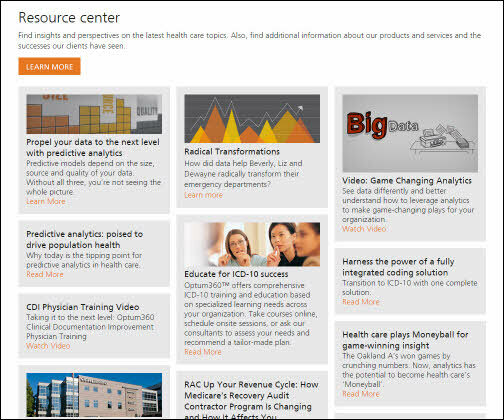 From there, the team built out topics for Optum's content to cover. "We hadn't even started the campaign yet," she said. "It was dialogues around what is going on in the marketplace and how can we educate them and what topics do we need to be speaking to." Through their research, the team found that many people were overwhelmed and confused by the complicated concept and intricacies of healthcare-focused analytics. They sought to explain analytics in a non-technical, easy-to-digest format. This focus on digestible analytics became the inspiration for Optum's flagship piece of content — an eBook. "I felt like we needed a lighter forum to have the conversation about analytics," Thomas-Smith said. "If you look at the marketplace today, there are probably over 200 competitors … entering this space daily because it is the next wave in healthcare. The market is ill-defined and the market has a lot of confusion," Thomas-Smith said. This information was presented as an eBook as opposed to a white paper because the team felt an eBook was a less serious format. The eBook also allowed for more levity, the incorporation of more graphics and was unlike anything competitor organizations had in the marketplace. Finally, this large starting piece allowed the team more opportunities to reimagine the content. "Reimagine" is a word that is used often by the Optum marketing team, and it's a word that was used from the beginning of this content marketing campaign. To "reimagine content" is to use existing brand content to create new content. The potential to reimagine content was an important part of this campaign. According to Thomas-Smith, for a content marketing strategy to work, you have to continually have new content to feed it. Not having enough content or not producing content that can be repurposed is a potential pitfall that affects many companies. "We knew that [the eBook] was our first piece of content, and we couldn't put it out there and not have something next to tell our prospects and clients," she said. "We had to keep putting well-thought-out, impactful content. Very quickly, we started reimagining everything we could get our paws on." The team developed a rough reimagining plan for all of its content. For example, any time the team writes a white paper, they then develop a blog series that may have as many as 12 posts. For some of the larger content projects, several supplementary content pieces are developed, including a social plan, banner ads, pay-per-click ads, infographics and podcasts. This strategy gives the secondary content a promotional function. "We'll take a white paper and reimagine that into 20 to 30 more pieces of content and put it out in different types of distribution channels," Thomas-Smith said. The Optum team also designs content for the level below the C-suite, which is more tech-savvy. "We do the gamut of direct mail pieces, all the way to blogs, Twitter, LinkedIn. We really are leveraging every distribution channel out there because we have a need to speak in so many different languages," she said. The team uses landing pages, ads, direct emails and other content to make the first introduction between Optum and a potential prospect. Once prospects start consuming more content, they are moved to the education phase, which is where lead nurturing efforts are implemented. This phase features personalized landing pages that highlight the subjects that matter to that specific prospect. This is also where persona-driven content strategy comes into play. "Our lead nurture has to be just like a series of cul-de-sacs," Thomas-Smith said. "[Prospects] don't ever hit a dead end. They just can keep looping around and finding the content that they need to find that speaks to them where they are in their learning, where they are in their process." During this stage — the education stage — prospects are scored based on their interactions, how much content they consume, what they're consuming, how long they spend on the site and how often they come back. When a prospect earns a certain lead score, that prospect goes to Optum's business development team, which will continue to qualify that prospect. "That really is the connect phase, the business development. Then they move through to the field sales," she said. Through this content-focused approach, the marketing team has a large amount of data on a lead before that lead is ever contacted. This gives the business development team insight into how they should appeal to the prospect as well as what the prospect may be looking for. This strategy marks a drastic shift from Optum's old "one and done" strategy. "I always get tickled when somebody goes to a trade show and they say, 'This is a hot lead.' There's no such thing as a hot lead at a trade show," Thomas-Smith said. "I would rather send fewer high quality leads than volume." From this content marketing effort, the team at Optum has drastically increased the amount of content they produce in a short amount of time. The entire campaign took 10 months to plan, research and implement. At the end of those 10 months, Optum had produced over 500 pieces of unique content. At the end of 18 months, the team had produced over 1,000 unique pieces. Now that Thomas-Smith and her team have developed their content marketing strategy, they can be more selective about the reimagined content they produce. "We still reimagine, but we do a lot of A/B testing and we will find and have the luxury to say, 'This piece of content is stronger than this piece. Let's reimagine this piece and do a micro campaign,' or maybe, 'Let's reimagine this piece that didn't do as strong in this distribution channel and try it elsewhere,'" she said. When asked about what her takeaways were from this campaign, Thomas-Smith highlighted the value of educating your market, company and team about content marketing's purpose and importance. "I think people underestimate what it takes to do content marketing well," she said. "It's not for the faint of heart. Once you send out to the marketplace that you are a trusted source and a trusted educator, if you cut that spigot off, you've actually hurt yourself more than helped yourself." "I think that's one big takeaway — that you need to go slow to go fast," she concluded. Optum will be speaking on this campaign at MarketingSherpa Summit 2016, held February 22-24 at the Bellagio in Las Vegas. This campaign has been selected for the Best in Show award, and Karen Thomas-Smith will be a featured speaker for Summit 2016. Get the first look at consumer purchase preference data — Take 15 minutes to complete the 2015 MarketingSherpa Practices Survey, and get a free pre-release copy of the August 2015 MarketingSherpa Consumer Purchase Preference Survey plus a chance to win a free, three-day ticket to MarketingSherpa Summit 2016 in Las Vegas or an iPad Air 2. The deadline is September 28.